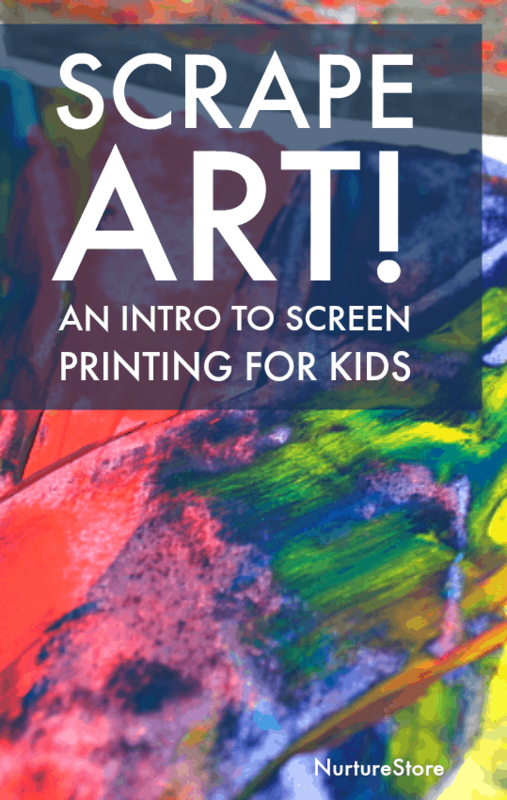 This scrape painting lesson is a fun and creative process-art lesson and a great introduction to screen printing for kids. 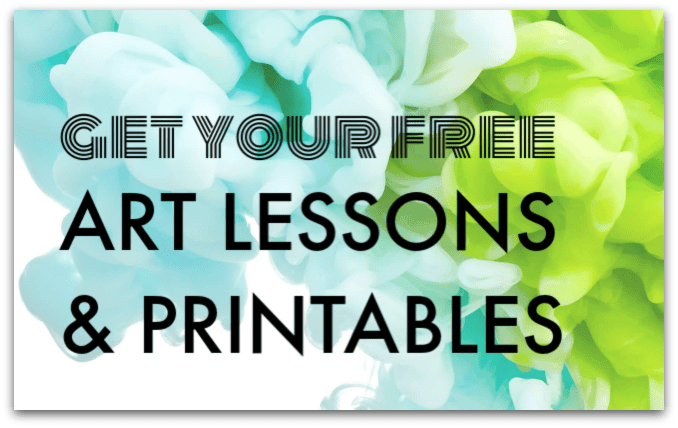 :: how to extend your art practice into further materials and ways of working, including an introduction to the process of screen printing. We can broaden our children’s art experiences by using very familiar materials in different ways. 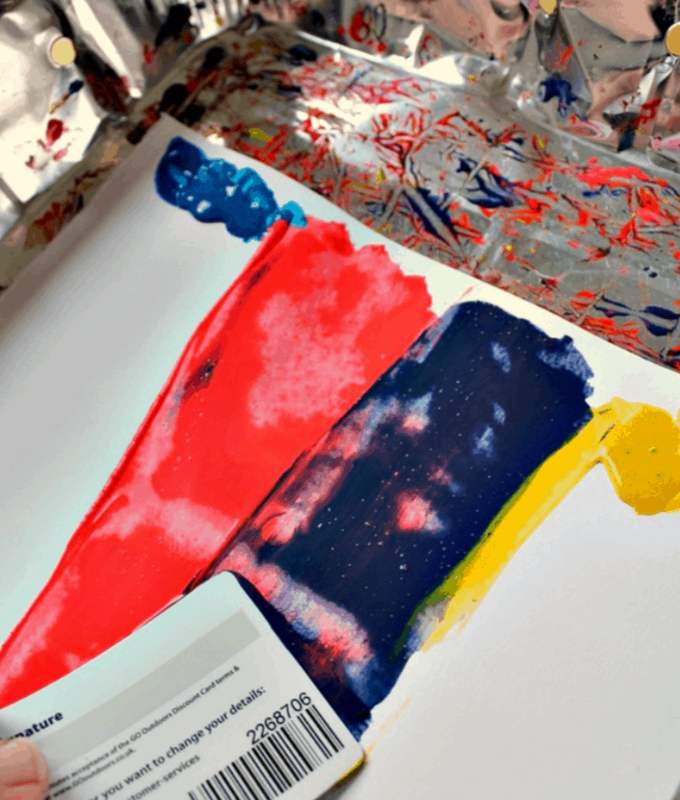 In this art process we are using paints as we often do, but this time using cards to scrape the paint across our artworks, rather than painting with brushes or our fingers. Use thick paper or a piece of card as your painting surface. Choose a selection of paint and apply small pools of it to one edge of your paper. Use old credit cards (or similar) or rectangles of thick, flat cardboard to scrape through the paint and across your paper. The cards will slide the paint along. 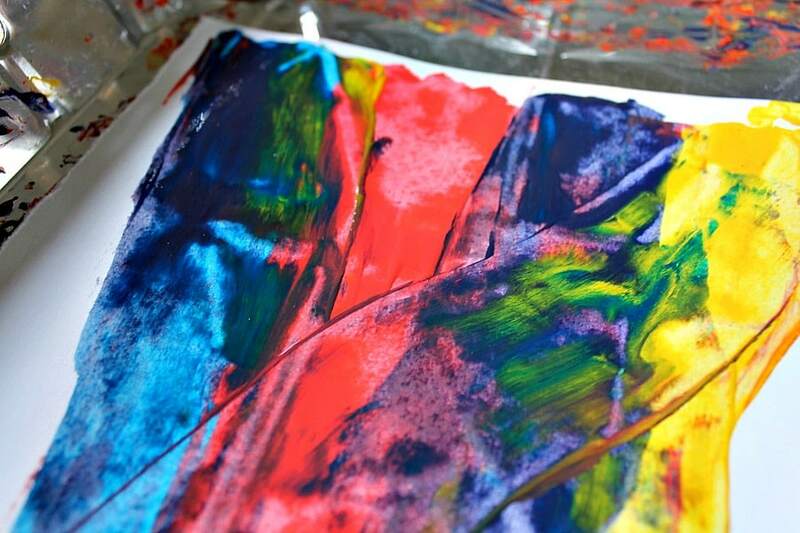 You can experiment with different movements and try mixing different colours of paint together. Try moving your paint or making marks using different objects, such as forks, combs, potato mashes, chopsticks or hair brushes. Use your fingers to scrape through the paint. 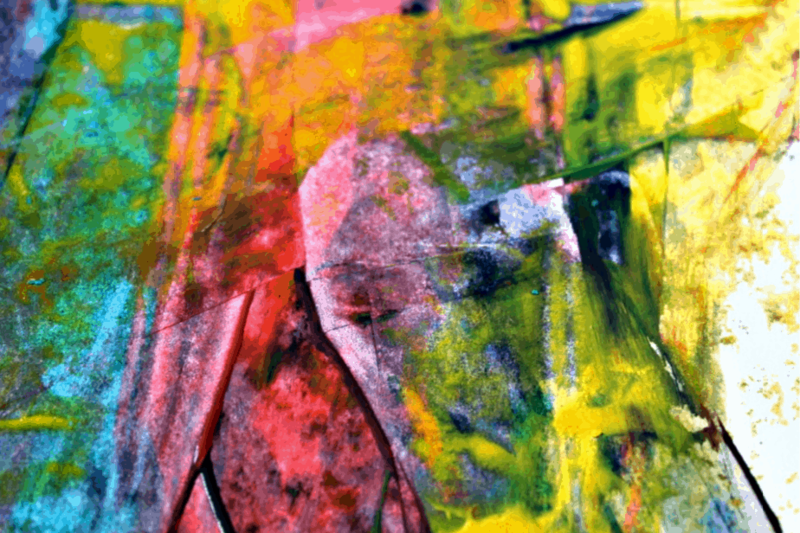 Combine this scrape-painting process with my art and music project and try matching your movements to apiece of music. Use low-tack washi tape or decorators’ tape to mark out a pattern, shape or word onto your piece of paper before you apply the scrape painting technique on top. Once you have filled your page with colour, carefully peel back the tape to reveal the negative space of your hidden design. This scrape painting technique can be extended into an exploration of screen printing. You can begin by making a stencil sheet: cut a simple shape out of a piece of thick card. Place this stencil sheet down on your piece of paper, add your pool of paint on top of the stencil sheet, and use the scrape painting technique to scrape the paint over the surface of your stencil sheet. Peel back the stencil sheet to reveal the print of your shape on the bottom sheet of paper. You can layer-on different stencils, and use different colours of paint, to build your picture.